Closeout Sale -- check out these awesome deals! Limited Quantities available - Order TODAY! Great Year-End Gift ideas, order early - Stock up now for future projects! Friends of Exchange CD – Bill and Kim Nash A generous gift from Bill and Kim Nash, Friends of Exchange features nine songs, including “You Can Make a Change With Exchange”. 50% of each sale will go to the NEC Foundation and 50% to Champions Kids Camp. CLEARANCE! 100% pre-shrunk cotton T-shirt featuring our lovable Time Out Teddy and the slogan,“Take Time Out to be a Better Parent.” Available in sizes Large to 3X-Large. CLEARANCE was $52.95! Fashionable and contemporary … wear your Exchange pride in name-brand style! Red heather with Exchange Emblem embroidered on left chest.100% polyester lightweight fabric and smooth hand-feel. CLEARANCE was $52.95!Fashionable and contemporary … wear your Exchange pride in name-brand style! 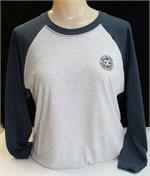 Navy/grey heather with Exchange Emblem embroidered on left chest; tone-on-tone. 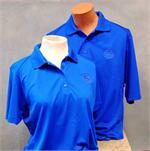 100 % polyester with hydrophilic finish; lightweight fabric. CLEARANCE - Limited sizes & quantities available.....was $38.95! Modern and stylish! Dark red heather with Exchange Emblem embroidered on left chest; tone-on-tone. 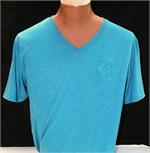 100% polyester yarn dye striped heather jersey knit polo with self-fabric collar. CLEARANCE - Limited sizes & quantities available..... was $13.75! A contemporary twist on a traditional look! Available in Galapagos Blue. Exchange Emblem embroidered on left chest; tone-on-tone. 50% polyester, 25% combed ring-spun cotton, 25% rayon. CLEARANCE - Limited sizes & quantities available..... was $13.75! Oh, so soft! This white heather body shirt features indigo blue sleeves and neck trim. Exchange Emblem imprinted on left chest in indigo blue to match trim. Attendance Pin with two, 1-pt. diamonds. ***Diamond Pins will no longer be a Stock Item -please allow 6-8 weeks for delivery. CLEARANCE was $35 now $30! Item discontinued - limited sizes & quantities available. 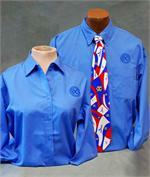 Port Auhority Easy Care Long Sleeve Dress Shirt, Ultramarine Blue with tone on tone Exchange Club Emblem. Available in Mens & Ladies Sizes. CLEARANCE! Item discontinued - limited sizes & quantities available Port Auhority Easy Care Long Sleeve Dress Shirt, Ultramarine Blue with tone on tone Exchange Club Emblem. Available in Mens & Ladies Sizes. CLEARANCE! Item discontinued - limited sizes & quantities available. 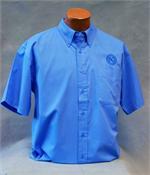 Port Authority Easy Care Short Sleeve Dress Shirt, Ultramarine Blue with tone on tone Exchange Club Emblem. Available in Men's Sizes. CLEARANCE! Item discontinued - limited sizes & quantities available. Easy care polyester pique polo shirt. Features embroidered Exchange Club Emblem. Available in Ladies sizes Med. CLEARANCE! 10 oz. 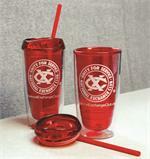 Ceramic Travel Tumbler with Red Silicone Lid 2-color Exchange Strong imprint on 1-side. 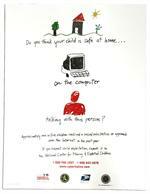 Colorful 25” x 19” poster warns parents about online predators and provides phone numbers to report suspected child exploitation to the National Center for Missing & Exploited Children. Pack of 100. Dues statement sets. Includes window envelopes. CLEARANCE! Women's Easy Care Shirts (Short Sleeve), 65% Polyester/35% Cotton, Wrinkle Resistant plus Antimicrobial Fabric Shield in Black features EXCHANGE STRONG Art. CLEARANCE! Edwards Garment Men's Easy Care Shirts (Short Sleeve), 65% Polyester/35% Cotton, 1 Pocket, Button-Down Collar, Matching Buttons, Wrinkle Resistant plus Antimicrobial Fabric Shield features EXCHANGE STRONG Art. CLEARANCE! 16 oz. Hot/Cold Tumbler Double-wall acrylic body with push on thumb-slide lid. Acrylic straw with stopper for cold beverages included. BPA free. Red with white imprint. CLEARANCE!This colorful and fun bag has so many possible uses! 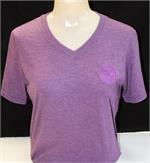 Purple with light green imprint and trim. 9.5”w x 9.5”h x 4.5”d. Standard size lunch bag made from neoprene; complete with a zipper for secure storage. CLEARANCE save $10.00! Distinctive blue dyed silk 60"x12" Scarf features repeating pattern of “XC”s and blue ribbons. CLEARANCE was $18/$20 now just $15! An unbeatable alternative to a jersey or interlock tee, our RacerMesh Tee will win you over with subtle mesh texture and moisture-wicking performance. CLEARANCE! 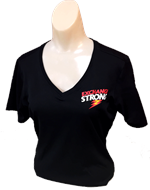 Heather Gray T-shirt featuring New EXCHANGE STRONG Logo. Imprinted on front & Back. CLEARANCE - Limited sizes & quantities available. 100% Cotton Fleece Authentic Pigment 11 oz 100% Cotton Fleece Zippered Hood Denim Color. Available in size Small, LG to 2X-Large.